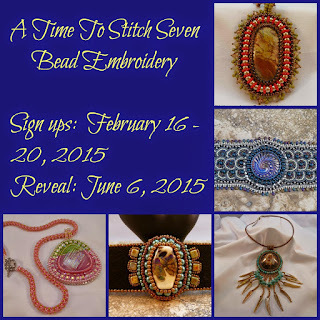 Today is the reveal day for A Time To Stitch (ATTS), hosted by Therese and Christine for a whopping seventh time! The theme/challenge this time around is bead embroidery. I dabble in embroidery periodically but it's something I always feel I can use more practice in, so I was excited for this ATTS! During sign-ups Therese gave away some of her stones which she personally cuts and polishes into stunning cabochons. I was the lucky and happy recipient of this gorgeous petrified wood with wormholes! I absolutely adore this cab! I love all the creamy colors and the shots of pinkish orange. Seriously - these are 'my colors'!!! Which was just good luck, because Therese pre-packaged these, and sent these out randomly. I just knew I had to hug this cab with some creamy colors. My first selection were these pearl colored size 8 charlottes. After starting one embroidered row around the cab, I decided to step up and start a short peyote to frame the cab even more. This cab is so pretty on it's own I didn't want to go too crazy with too much embellishment. One of my struggles with embroidery, I realized with this challenge, I sometimes try to rush the process by adding too many beads per stitch. Another challenge, is trying to keep each stitch nice and tight, when I really should be giving each stitch a millimeter or less of wiggle room so the beads can stand nice and pretty on their own without puckering! 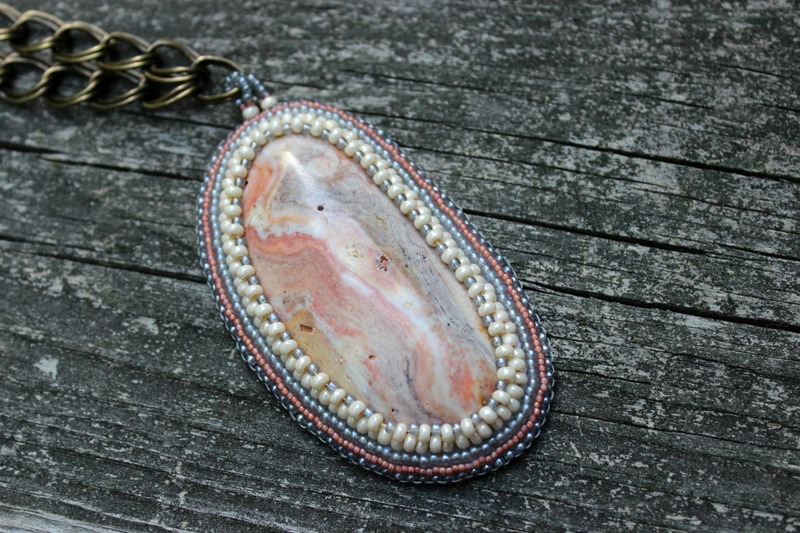 I took my time on this challenge and only added two beads per stitch (which was great when I decided at the last minute to add that peyote bezel, I knew straight away that I had an even count!). Finishing an embroidered piece can sometimes be a challenge as well. When finishing, I kept my mantra, 'not too tight' and everything went swimmingly. 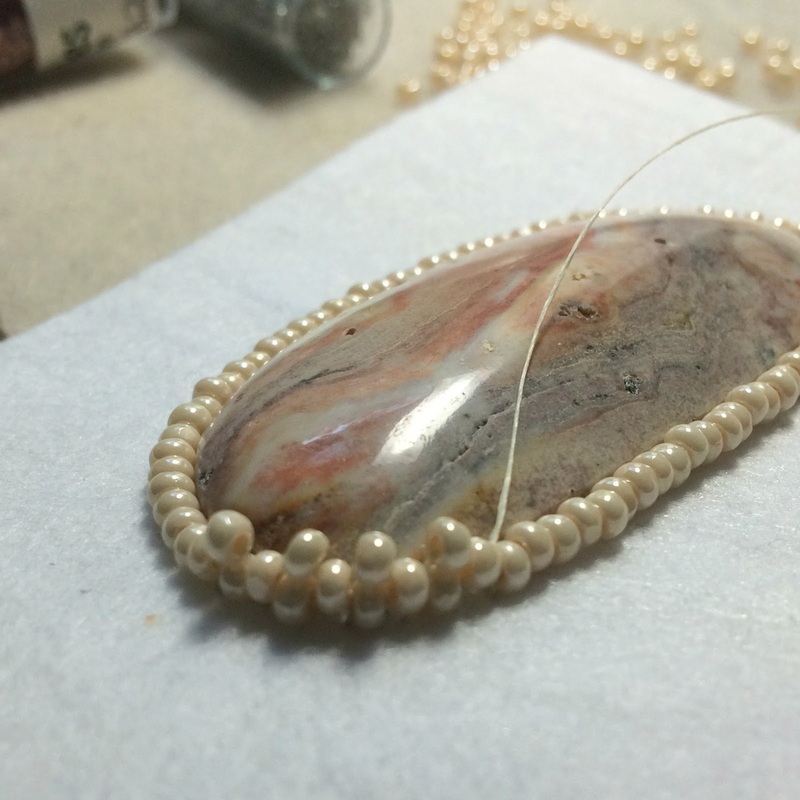 A simple beaded bail to attach the chain. I was psyched there was a piece of gray ultrasuede in my stash that matched the cab so perfectly. Some grey Nymo thread added to the cohesiveness! This piece is simple, but it was a fantastic study in embroidery for me. The cabochon Therese created was so gorgeous I really wanted to make sure it shined with some good beadwork around the outside and that really forced me to take my time, pull stitches out when necessary, and make sure nothing came out too wonky. Thank you, as always, to our hosts Christine and Therese. This challenge is such a great idea, and a fun way for beaders to practice and hone in on their skills! I can't wait to see what ATTS #8 brings! Please click on the links below to take a look at other ATTS participants' creations! The colors you selected to go with your cab are perfect! And your stitches are just right!! Love it. I love what you did with the cabochon you received from me. I too love the colors in the petrified wood and the colors you chose just enhances the natural colors of the wood. I agree with you on keeping it simple to let the petrified wood be the star, great job. Thank you for participating again in round 7. I do not know just yet what Christine and I will present for ATTS 8, just stay tuned. Your beading is so perfect with the cabochon. Your necklace is so simple, sophisticated and natural, I love it! On My Goodness, Amy!!! Therese's lapidary paired with your comfort with these soft colors and your talent and patience resulted in a GORGEOUS piece of jewelry!!! Gorgeous! From the photos, if you didn't say petrified wood, I would have thought it was a piece of shell. Gorgeous!!! Thank you for being a part of this hop. You are my second stop today, but I think I am going to drool a lot. Hi Amy, What a great job you did with your cab. It's creamy-dreamy! 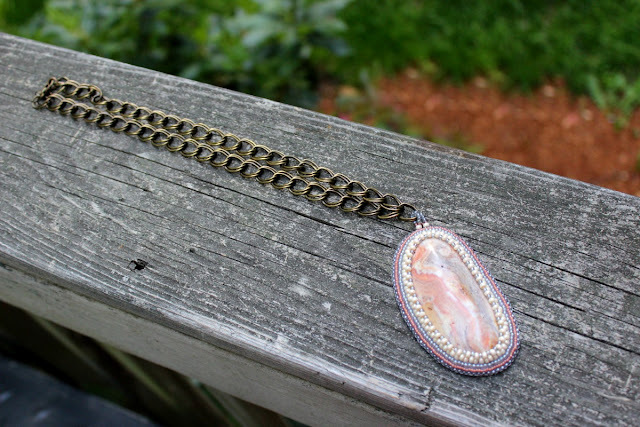 And I really like it paired with the chain for a really fresh, young look. Sometimes bead embroidery can be a bit formal. I agree about taking your time on the cab surround. I have done countless rip-outs when I tried to push and find that listening to the cab helps guide the process. (Doesn't that sound granola?) Wonderful job! We are such kindred souls, I too took time to really study bead embroidery when I got into it, and it has paid off. Lucky you to get such an incredibly gorgeous cab, you were bang on with your choice of beads to showcase it. I may be simple but it is stunning. Great design Amy my friend! Amy, that is a gorgeous piece! Your bead choices did a spectacular job of pulling out the colors of the cab, and it's clear that you took lots of care in the stitching. It's a lovely, elegant, beautifully finished pendant -- I wouldn't be surprised if people try to buy it right off of you every time you wear it! Beautiful! 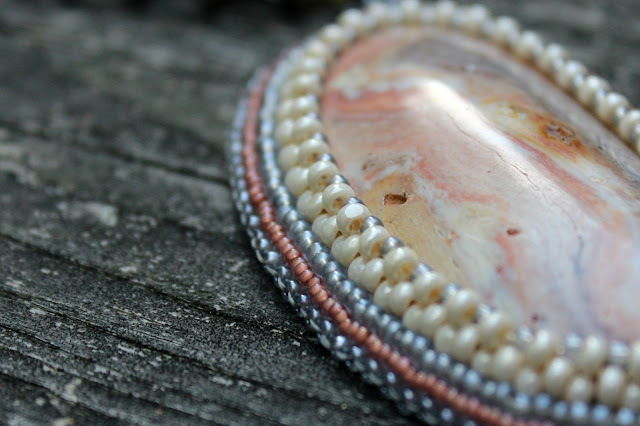 Therese's cabochon is gorgeous, and your embroidery is perfect for it. I also loved your discussion of process, as I'm still experimenting with bead embroidery myself. Your attention to the details definitely paid off in spades! That's what I call proper bead embroidery... yeah, this thing is not for me for sure :) I love your beautiful, gorgeous piece! Your pendant is so beautiful. I love the colors!! Hi Amy, Your bead embroidery is beautiful. You chose the colors well. Excellent pairing of colors for the petrified wood. You enhanced the cab and highlighted it's beauty in the very best way. Gorgeous!!! I still try to squeeze too many beads in sometimes, I know better even when I'm doing it but sometimes I just can't help myself. Your beads laid perfectly, cozy but not tight. Seems to me like you should do more bead embroidery, you are a natural! I love these colors. I can't believe how perfectly the beads compliment the stone. It's absolutely superb. The simple finish for the bail may be just what I need for another challenge I'm working on. Thanks! Beautiful! Your color matching is right on spot! It is really a stunning piece! Thanks for sharing with us! Such a beautiful piece!!! I love the colours you have used they go so well with the cab and it all looks so beautifully neat and feminine, just stunning! Beautiful! hasn't this been so fun! I too am learning along the way and love Therese's cabs!! a lovely pendent! The colours you chose were perfect for that cab and your stitching is so neat! Your mad skills never cease to amaze me Amy! Beautiful job! Your piece is simply stunning. Has a very calming look to it. I love how the beads brought out the colors in the stone. Great job.